Around five hours into the run, Jared turns his head just slightly and through labored breath says, ” It’s okay if you want to go around and hammer up, I don’t want to hold you back”. I smile, although he can’t see it, and think to myself, “not a chance in hell”. We are in the middle of our fourth lap up Grandeur Peak (one of the peaks that forms the Salt Lake Skyline) and Jared is crushing me. 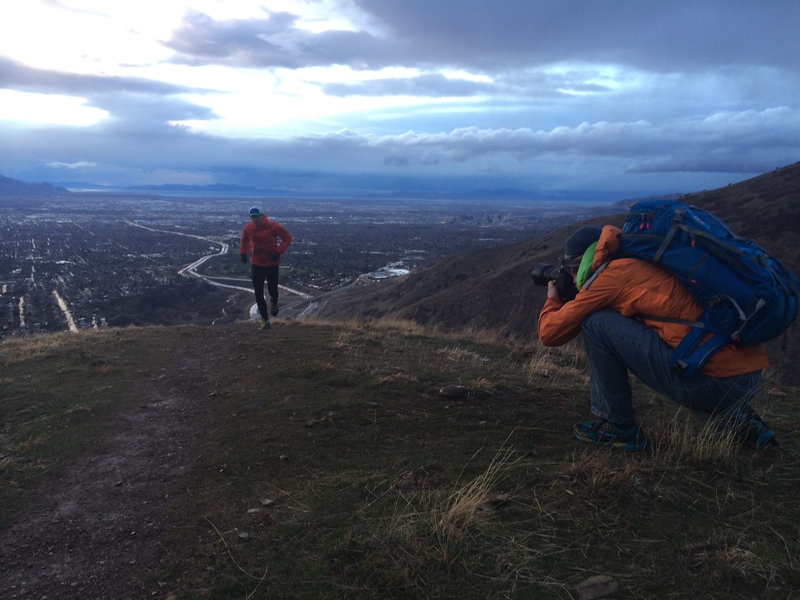 A few years ago Jared teamed up with Breathe Utah and ran laps on the Peak as a way to raise awareness of the ever growing air pollution problem in Salt Lake. The first year he ran 10 laps, last year he did 12, and this year he set the goal of cranking out 15 laps. 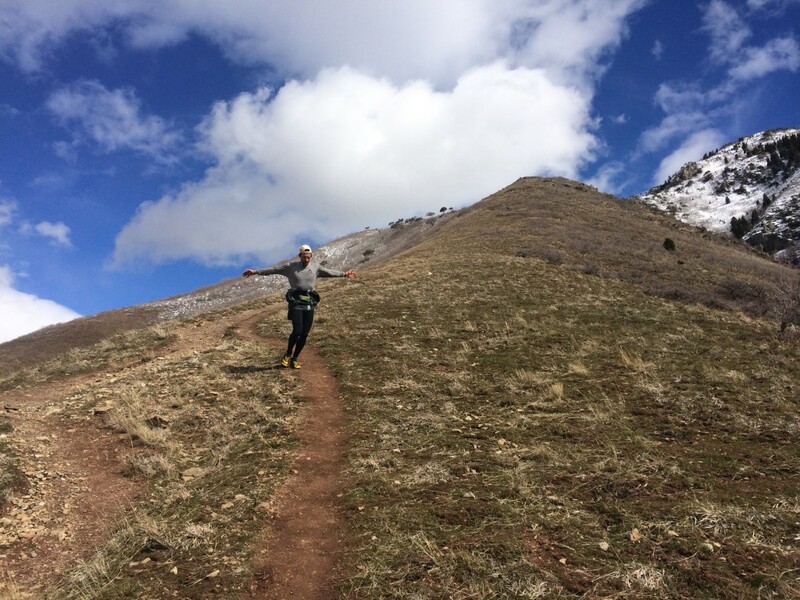 Now, before I go any further, you need to understand that this isn’t a lap on just any peak in the Wasatch. The Westside Trail up Grandeur is short, 2.25 miles, and very, very steep. As a matter of fact it climbs more than 3,400′ in the 2.25 miles that it takes to get to the summit. If your mind has not already started to do the arithmetic about Jared’s goals, let me help. 10 laps x 3,400′ = 34,000′ ascent, and descent in 45 miles.  His goal of 15 laps would result in 51,000′ ascent in 67.5 miles. At this point your mind should be blown. I cannot think of any other person that would even consider doing this project, except Jared. 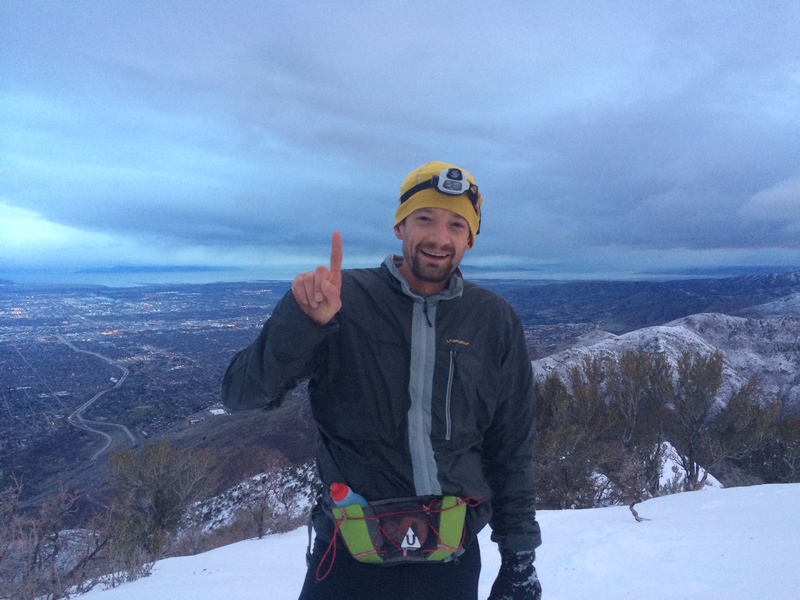 He is the burliest steep mountain runner/slogger/unrelenting person I know. I had known about Jared’s project for some time and had kind of committed in my mind to go down and support him for a few laps. When Ty Draney called and said he was going down, I threw my hat in the ring too. I didn’t commit to how much I would attempt, I only said I was going to drive down and see how it went. The weather forecast leading up to the RUFA put a little extra doubt in my mind about the feasibility of the undertaking; 35-42 degrees, 70% chance of rain below 6,000′, and snow above. That forecast would plant us perfectly in the worst kind of weather; cool and wet down low, cold and freezing up high. Given the forecast, I pretty much packed all of the cold weather running gear I had, and for good measure I threw in some ski gear (you know, just in case). At 6:00 a.m. a group of about 8 or so runners unceremoniously started up on the first lap of the day. I tucked in right behind Jared hoping that since he was going to be at it for 24-plus hours that the pace would be friendly. Did I already mention that Jared is a machine? Within minutes of the parking lot we had gapped the other runners and I was certain that Jared would break me in one lap. He plowed forward and upward, through dirt, mud, ice, and then to top it off, a couple hundred feet of crotch deep post-holing to get to the summit. 58 minutes after starting we snapped a quick photo, and headed down. 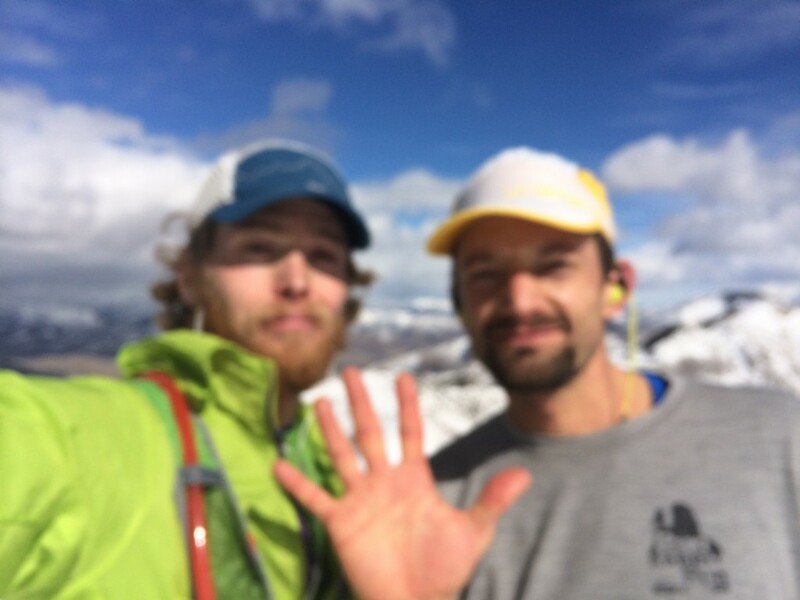 It was awesome to share the stoke with the other runners as we descended. Just under an hour and 30 minutes into Jared’s project we rolled into the parking lot. The weather was far better than forecasted. No precip, warmer temps, and only a jet-stream forced wind to contend with. After a minute or two in the parking lot adjusting gear, grabbing more food, and talking to the volunteers from Breathe Utah, we rolled out again, Jared still setting the pace. For several hours we repeated the route at nearly the same speed. Now back to the moment when Jared asked if I wanted to go around. You see, Jared had been setting a strong pace all morning and for some reason he thought I could go faster, while in all honesty it was all I could do to keep up. He just kept hammering! Between labored breathes I told Jared I was fine where I was, and amazed he even thought I could go any faster. I completed five laps with Jared in 7:59:10 and then I watched him leave the lot without me. Fuzzy picture to go with my fuzzy brain and legs. Five laps down. I had no specific goals for this project other than to give the legs a solid beating to use as a prep for Transvulcania in a few months. To be truthful, I was shredded. I hung around the base for a couple of hours chatting with friends, making new acquaintances, and watching Jared come and go. Around 5:00 p.m. my good friend, Fred Marmsater showed up and we headed back up the peak to try and shoot some pictures. Somewhere about half way up Fred and I stopped and spent some time shooting some pics. For me this meant running back and forth in front of the camera. We worked our way up to a little above the snow line all the while shooting short sections of the trail. After about an hour and half of shooting, Jared rolled past again, looking solid wrapping up his seventh lap. Shortly after, Ty met up with us on his way down from his lap number five. He stopped and joined us for a bit more shooting before we headed back to the truck. 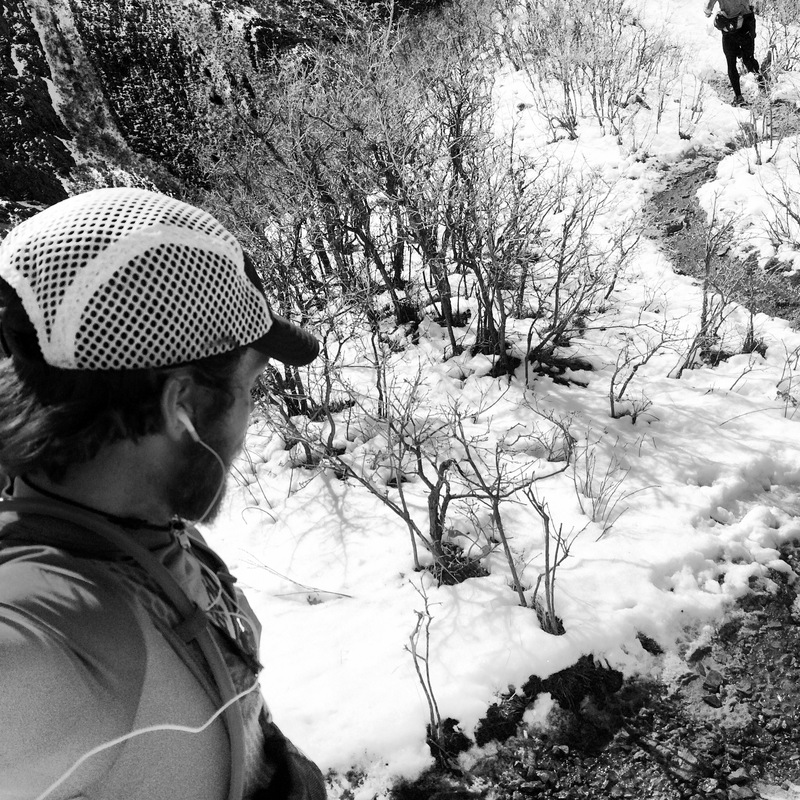 We crossed paths with Jared as he charged by on the way up towards his number eight. Ty and Fred making the magic happen. My watch ended up with well over 20,000′ ascent for the day and around 25 miles. As I drove home later that night I was overwhelmed just thinking of Jared still out there ticking off the laps in route to his goal. He is such a legend! Today, as I hobble up and down the stairs in my house, I am already considering what projects and goals I have overlooked because on initial thought they seemed too difficult. It is time to revisit what the impossible, because if Jared can do 15 laps on Grandeur, what can you do? 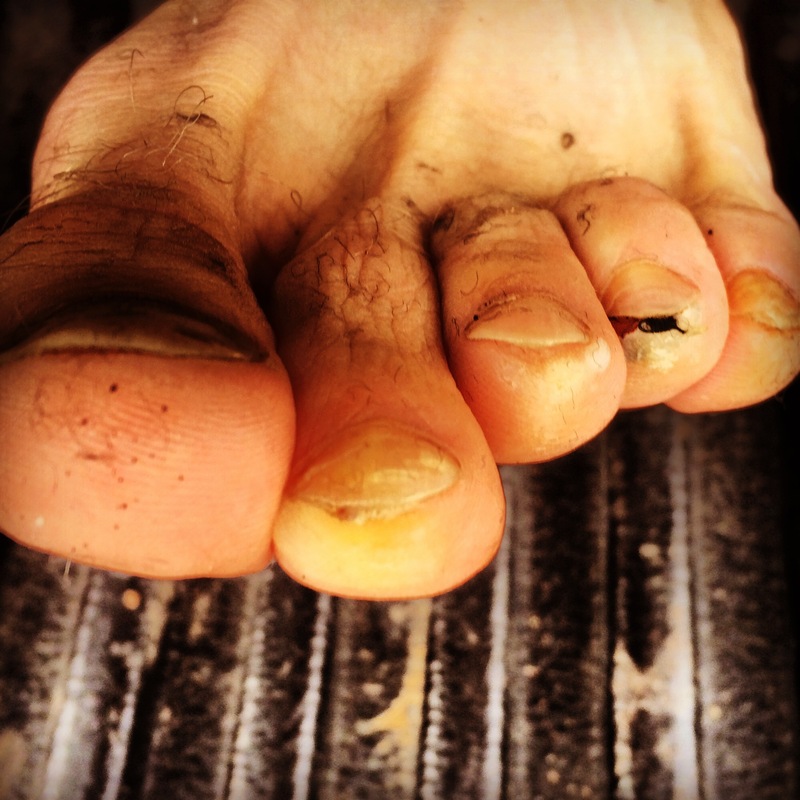 Tortured toes after 20k of descent. Patagonia Houdini, Forerunner Tee, Capilene 1 long sleeve, Strider pro shorts, all weather 3/4 tight, lightweight merino ankle sock, Everlong, and Duckbill cap. First Endurance EFS, EFS LS, and Ultragen.